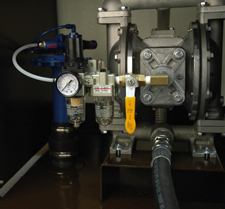 Used oil evacuation, storage and transfer is safer, cleaner and faster with a pump-assist system from JohnDow Industries. Ideal for new car dealers, tire and automotive service stores and dealers, heavy-duty fleet owners and operators and municipal garages. With a 30 gpm capacity catch containers are quickly emptied. 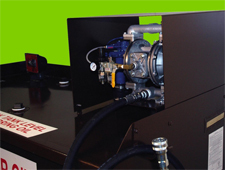 A filter regulator and air valve is included. Just connect shop air and it’s ready to use. 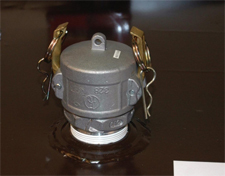 This special valve prevents the operator from overfilling the tank and causing a spill. 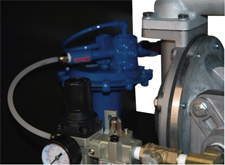 When the tank level gets to the maximum safe capacity the valve will automatically shut-off the air supply to the pump. Until the tank is emptied, the pump will not work. 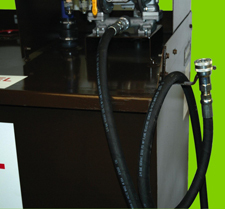 The 10' hose is equipped with a quick-connect coupler making emptying a used oil drain easy and clean. A hanger bracket on the tank keeps the hose out of the way until needed. 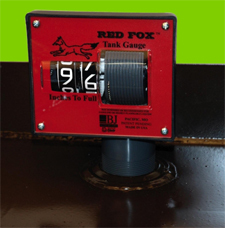 An easy-to-read fluid level gauge shows the operator the remaining tank capacity and is a reminder to have the tank emptied. The 2” fill spout makes refilling the Fuel Cart easy. The vented cap keeps the tank closed and provides pressure relief when required. Both workbench and vertical style tanks are equipped with a protective cover that shields the diaphragm pump, auto shut-off valve and fittings. AGS-180D Workbench 180 Gallons 56" x 28" x 40" 725 lbs. Important Installation Information Before purchasing a used oil storage tank or system be sure to check the local regulations. Many cities and municipalities require a permit for used oil storage. Check with your local building department or fire marshal. If you need assistance with installation and/or permitting contact us. JohnDow Industries has been designing and permitting aboveground tanks for over 20 years with 1000’s of installations across the country. We can assist you to make the process easier.